I got a chance to see “William Blake’s World: ‘A New Heaven is Begun'” this past weekend at the Morgan Library and Museum in New York City. The exhibit’s title refers to Blake’s own Marriage of Heaven and Hell, in which he notes that his birth marks the occasion when “a new heaven is begun, and it is not thirty-three years since its advent.” Blake’s belief that he was the inheritor of an artistic tradition pre-figured in Milton and Michelangelo drove him to create works that revealed an extraordinary outlook on religion, philosophy, and artistic creation. This exhibit seeks to captures key moments in the evolution and development of Blake’s works and frameworks, and is particularly focused on framing Blake’s apocalyptic-artistic vision alongside the more pressing demands of the contemporary marketplace. The Morgan has also put up an online version of the exhibit, available here. The exhibit includes a fantastic and carefully displayed selection of Blake’s more and less familiar works, from early commissions to letters and copies of later illuminated works like the Butts Set of The Book of Job. Also making an appearance are several works by the “Ancients,” a group of Blake followers that included John Linnell, Edward Calvert, and Samuel Palmer, as well as works by other contemporary artists and friends of Blake like Henry Fuseli. These serve both to put Blake in the context of contemporary artists, and to reveal his own deep influences and interactions with the people around him. The choice to include these works firmly grounds Blake in the society surrounding him, and serves partially to interrogate the (very Romantic) myth of the solitary genius, creating from his own visions while shunning the outside world. Blake’s formal training, his commissions, and the works of his friends all place him squarely within the business of artistic production and the London marketplace, while also pointing to the revolutionary role he played in aesthetics and poetics. The exhibit presents us with several stages of Blake’s works, beginning with a few of his early engravings finished just after his apprenticeship, including Morning Amusement and Evening Amusement, after Jean-Antoine Watteau. Many of these works were designed to showcase his engraving abilities, although he failed to garner many large commissions. 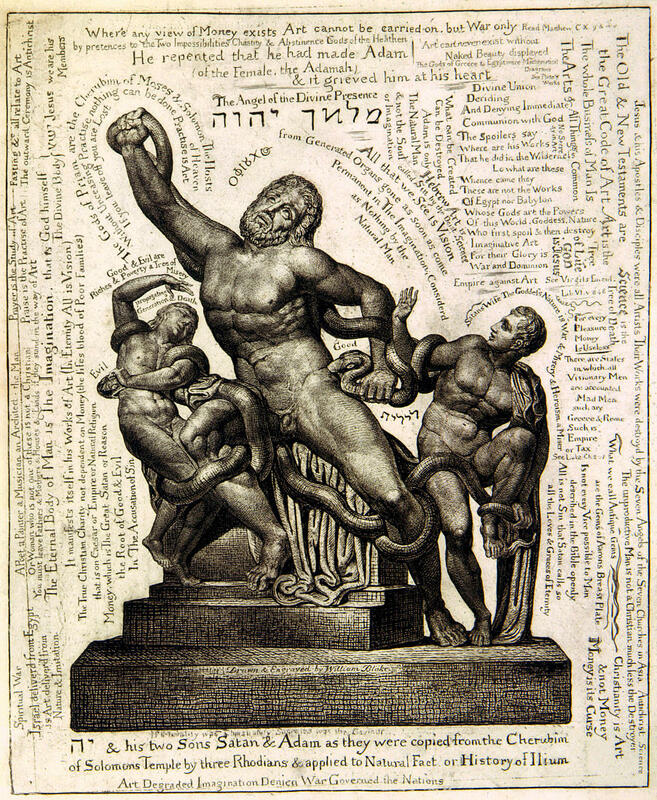 Following these early engravings are selected works from Blake’s contemporaries, including the Ancients. The Ancients adopted Blake’s appreciation of earlier art, especially the works of Michelangelo and Milton. What struck me most about many of these works, though, was their seeming break from artistic tradition. John Flaxman’s “Awake, arise, rouse her as I rose thee. The Furies” and “Behold this proud oppressor of my country; Choephora“ were praised as hearkening back to classical forms, but they seem also to prefigure the style of the Decadent period in the fin-de-siecle, which valued symbolism as well as more abstract, artificial forms. Blake’s works are often described as breaking artistic boundaries and being ahead of their time, and it’s clear from this exhibit that he influenced others to do the same. As perhaps another prefiguration, Samuel Palmer’s Pear Tree in a Walled Garden struck me because of its proto-Impressionistic style and subtle, rich coloring. The story of Job is of a good man sorely tested in order to understand the relationship between the evil of suffering and the existence of God. In Blake’s version, Job’s major flaw is attending to the letter, rather than the spirit, of God’s law. In doing so, Job falls under Satan’s spell and his suffering progresses into the horrible vision of a cloven-hoofed demon in the eleventh plate, Job’s Evil Dreams. Also included are Blake’s earlier Continental Prophecies, Europe, The Song of Los, Jerusalem, and America. These were particularly striking in person, where their beautiful coloring can be seen firsthand, without the mediation of a computer screen or a less-than-perfect reproduction. The works focus on revolution and upheaval, in which figures like the fiery Orc, the spirit of revolt, take on the powers of Blake’s despotic Urizen. The final mounted works I came to were his illustrations of Milton’s L’Allegro and Il Penseroso. Having these placed last on the wall as you walk around the exhibit (or, alternatively, first, depending on which way you choose to go after walking through the door) brings you back full circle to Blake’s predecessors — to those artists he felt were his creative ancestors. The exhibit also included several cases of materials ranging from letters to commercial book illustrations and depictions of visions, as well as other works like All Religions are One and There Is No Natural Religion. Here again, the museum has sought to illuminate Blake’s spiritual visions alongside his commercial work, calling our attention to both sides of his creative process. One example of this is Case IV, which includes both Blake’s (very humorous) illustrations for William Hayley’s Ballads (look for the dog saving his master from a crocodile by offering himself up to the jaws of the beast), along with Blake’s vision of Wat Tyler, the leader of a fourteenth-century revolt against the poll tax. The Morgan notes that “Blake [perhaps] felt a kinship [with Tyler] based upon his own antimonarchical stance that had led to a trial for sedition in Felpham a few years earlier.” This sketch, done in 1819, was the last in a series of visions Blake sketched for his friend John Varley. The Morgan has done a phenomenal job of capturing critical moments in Blake’s life and work. 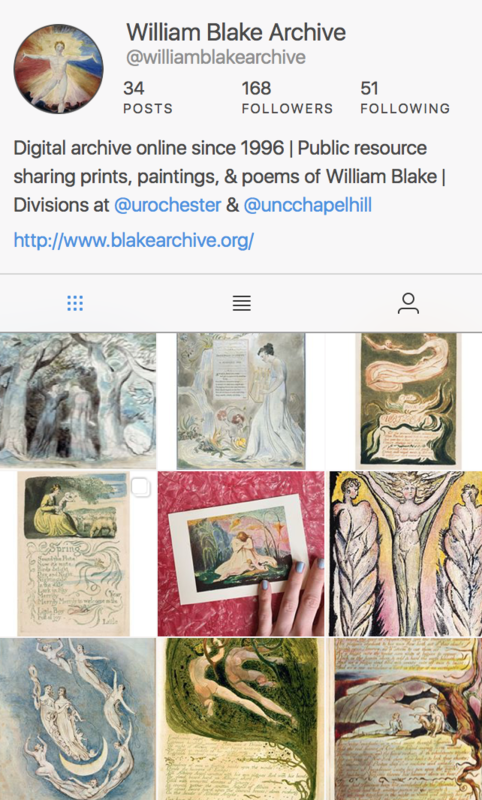 This exhibit allows each of us to move through Blake’s evolving spiritual and artistic philosophies while retaining his very important link to contemporary artists, his own training and background, and the swiftly-changing requirements of the literary and artistic marketplace of the eighteenth and nineteenth centuries. The exhibit runs until January 3, 2010, at the Morgan Library and Museum.